I have an exciting book series to share with you today! This one was a little out of my usual because I don't usually read suspense but wow was it worth it! 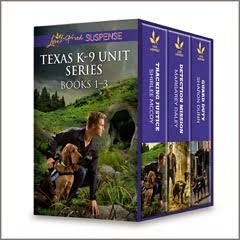 Texas K-9 Unit is a series of books from three wonderful authors. Each book features a police officer with their canine help. These are clean books that feature romance but don't go to deep (you won't blush with these!). I appreciated that aspect. So far I've read through the book 1 in the series and it was great from page one. I had to read it pretty fast because there was a good amount of suspense and I needed to know how it would end. Like I stated earlier the romance was just enough to spark interest without revealing too much. I can't wait to finish the series! Love Inspired Suspense authors Shirlee McCoy, Margaret Daley and Sharon Dunn will get your pulse racing with tales of Texas cops and their loyal K-9 dogs tracking down a crime ring. Enjoy three action-packed Texas K-9 Unit romantic suspense novels in one box set! When a boy goes missing from his bedroom, a police detective must assure a desperate single mother that he and his trusty bloodhound will find her son. A woman with amnesia has to rely on an officer and his border collie to stay alive when she can't remember who tried to kill her. An FBI agent is called in to protect a single mother when the rookie K-9 officer witnesses a murder and becomes the killer's target. Shirlee McCoy has always loved making up stories. As a child she daydreamed elaborate tales in which she was the heroine — gutsy, strong and invincible. Though she soon grew out of her superhero fantasies, her love for storytelling never diminished. Shirlee knew early that she wanted to write inspirational fiction and began writing her first novel when she was a teenager. Still, it wasn't until her third son was born that she truly began pursuing her dream of being published. Three years later she sold her first book. Now a busy mother of four, Shirlee is a homeschool mom by day and an inspirational author by night. She and her husband and children live in Maryland and share their home with a dog and a guinea pig. Margaret has been writing for over 35 years. She started writing in the late 1970s because she wanted to see if she could put a whole story down on paper. That book is still in the drawer and will never see the light of day. But she was able to finish a book, which was her goal. She loved teaching and working with students with special needs, and recently retired from teaching to write full-time. When she isn't working, she loves to read, travel, and go to lunch and a movie with a friend. She and her husband, Mike, to whom she has been married for over 40 years live in Tulsa. Besides teaching and writing, she is also a mother of one. Her son, Shaun, is married with four daughters. Sharon Dunn first fell in love with mystery and suspense about the time she read Nancy Drew mysteries in the fifth grade. Her first book in the Ruby Taylor mysteries Romance Rustlers and Thunderbird Thieves was a finalist for the Romantic Times Inspirational Book of the Year. The second book in that series Sassy Cinderella and the Valiant Vigilante was voted Book of the Year by American Christian Fiction Writers. Her hobbies include reading, working out, hiking, trying to find things around the house and making pets out of the dust bunnies under the furniture. Before she started writing, she used to sew. Now she just collects fabric and patterns and fantasizes about projects. After nearly twenty seven years of marriage, Sharon lost her beloved husband in 2014. She lives with her three nearly grown children, two cats and a nervous border collie named Bart. I love a good mystery and these sound like a lot of fun. Thanks for the chance to win. I want to read these books because I very much enjoy romantic suspense.